Eating at Chik-Fil-A on Friday? So Wednesday has come and gone. 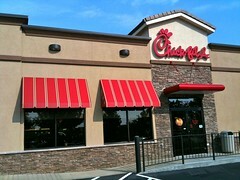 The Christian population did a very admirable thing in standing up for fellow brothers and sisters in Christ as they gathered to support Chik-Fil-A as an onslaught of attacks have come at the owner of the business from the politically-correct-agenda-supporters of our great nation. Now for the real test we’ll be faced with tomorrow. What message will believers send on Friday? Will we refrain from visiting the restaurant for fear of being seen among sinners? Sounds like an oxymoron, doesn’t it? Can sinners who have been saved by grace be embarrassed to be seen with sinners who need to be saved by grace? This may be one of those rare opportunities when the Christian community has the chance to carry the authentic Jesus into a crowd who too often hear a message that Jesus hasn’t sent. Technically, do we have a quarrel with the gay and lesbian communities? Didn’t Paul clearly tell us who our battles were really against? Should we find anger living in our hearts toward these people? …or does this imply we are a people who have forgotten the grace afforded to us while we were yet sinners. Hatred, strife, and abuse have no rightful dwelling place in the Gospel of Jesus Christ. We have a mission: Be the body of Christ that carries the good news to sinners. This entry was posted in WordPosts and tagged are we the body of Christ, being the body of Christ before the world, Chick-fil-A, Christianity, do they see Jesus in us, gay and lesbian community, going to eat at chik-fil-a on friday, the truth about the truth. Bookmark the permalink. 13 Responses to Eating at Chik-Fil-A on Friday? Okay, okay, I have to make one more comment before I disappear into from the never ending circle of the blogosphere. You keep making references to throwing rocks, of course referring to John 8. Many conservative scholars don’t even think that John 8, the story of the woman caught in adultery, is even in the canon because its not in the oldest manuscripts that we have in our possession. That being said its kinda shaky to use it as a proof text. Well, in my opinion anyway. But on to “point” number two. Do you realize that if we use John 8 as a standard then we can punish no one for immorality? I can see it now, “Your Honor, this man was caught stealing cars”. His Honor replies, “Let him who is without sin take him to jail”. And again, “Your honor, this man was seen killing another man and upon investigation we found 10 other bodies buried under his house.” And again, “Let him who is without sin, give the lethal injection.” And again!, “Your Honor, this man was caught molesting children”. The reply, “Let him who is without sin, castrate him”. And on and on it goes. If we go by what you’ve said we can’t even practice church discipline either. The accused is brought before the elders of the church, “This man and his wife were caught stealing tithe money from the church”, the reply from the elders, “Let him who is without sin demand the return of the money” or ” This man was caught in the very act of cheating on his wife and he’s the associate Pastor!”, the reply, “Let him who is without sin, cast the first excommunication vote”. Doesn’t this also throw a wrench into Romans 13? Brother, whatever Jesus meant here, it doesn’t seem to play out well in the way your using it. Oh yeah, and one more thing. “Later revelation supersedes previous revelation”. Thats the same argument the Mormon Church makes for the Book of Mormon, Doctrine and Covenants, and their Presidents official revelations! Goooooo Mitt ! Brotherman, that is the one thing I do not like about making comments on a blog. I could spend all day going back and forth with you on this and we would end up writing books answering one another and it would be fun!! But time does not allow. I will just have to eagerly await the next time we meet ! Yeah, it’s pretty much a see-saw circus trying to defend a view in a comment block. Speaking of “C” have you read “Against Calvanism” by Roger Olsen and “For Calvinism” by Michael Horton? Trying to muddle my way through both at the same time… thanks, brother! In Matthew 15 Jesus himself demanded an incorrigible child be stoned. The law in the OT civil law is constantly referenced even the restitution of Zacchias was strictly from the OT. Acts 25:11 shows that it is recognized that some sins deserve the death penalty. OT law practices all over the place in NT. “1. Jewish law requires that there be an accuser and that the accuser cast the first stone. There can be no trial without an accuser. 2. The trial was a kangaroo court. Jesus was not a judge, nor a Levite and had no authority to adjudicate the case. 3. An occupied nation was not allowed, under Roman rule, to put anyone to death. Rome reserved the right of capital punishment to themselves exclusively. 4. The Jews thought they had Jesus caught between the rock of Rome and the hard place of the Law. Reject the Law of Moses, violate the Law and lose all credibility with the Jews. Or command that the woman be stoned and violate the law of Rome and incur the wrath of the state. In either case Jesus’ ministry is ended. 5. Christ violated neither the Mosaic code nor the law of Rome. Let him who is without sin cast the first stone. No one dared make a claim to sinlessness. 6. Is there no one left to accuse you? None, Lord. Question 100. Is then the profaning of God’s name, by swearing and cursing, so heinous a sin, that his wrath is kindled against those who do not endeavour, as much as in them lies, to prevent and forbid such cursing and swearing? Hi Wesley! Good to see you friend. My words in this post in no way should be taken to assume God does hold every sin as an abomination against His holiness. Every sin not covered in the precious blood of Jesus will receive its due penalty. My point with these words is that it is not our responsibility to enact that punishment. It is also not my point to no longer identify sin and show how it grieves and angers our God so that sinners are not aware that there is a day coming when all who are not in Christ will face the wrath of this Holy God. By the way, you’re taking an argument from Matthew 15 to support a cause, when Jesus was using it to condemn those who would judge and enact their own punishment. These people were accusing the disciples of eating with dirty hands, and Jesus retaliated with, “You don’t even take of your own parents! Under OT Law, you should have been stoned!” Of course, we could really get down to brass tactics, and talk about unruly children being presented to the elders for stoning… but then, I guess there would be no one left in America today. Regardless of what Mr. Dabney has to say, Jesus said, “If you are without guilt, pick a stone up and kill this woman.” No one did. We are really fooling ourselves if we think we have any righteousness whatsoever (outside of Jesus’ righteousness) that exceeds that of the Jews of Jesus’ day. They were wise enough to put down their stones… and we should be too. Blessings and thanks for the great conversation. And yet the commandment in the Old Testament was to execute the homosexual, not Satan. Hmmmm, every passage in scripture that mentions this sin in particular comes across that God is pretty angry about it. Last I checked He even destroyed entire cities over it. He didn’t do that over every sin. Should I have a more “tolerant” heart than my Father? Interesting and valid points Hank. Interesting also is that as you commented I was reading Norman Geisler’s “Bible Difficulties.” I’m at a point where he is cautioning Bible students to abide by certain rules that if ignored can lead to erroneous conclusions. This section is titled, “Forgetting that Later Revelation Supersedes Previous Revelation.” He starts from the beginning with the command to not eat of a certain tree in the garden… no longer applicable. He then walks through a lot of OT stuff, showing that with the coming of new commandments, some of the older stuff is no longer in effect. (animal sacrifices, food laws and regulations) I say all of this because as the NT writers unfold their messages, we no longer find commands to stone people to death for their sins, no matter how bad. I was reminded recently by a good friend, that we are instead to put our stones down… well, unless we have no sin of course (if not, I guess we’re allowed to throw the first one).We’re going to have a hard time sharing the gospel with anyone as long as we insist on carrying a bag of rocks on our side. Grace brother! Excellent post, my friend! You offered us a challenge. How many of us have the courage to act on it?